To view the full size image, please click on the poster below. Driven by randomness and chance in the art process, artists like the Situationists and the Dadaists would consider this as an effective way to discover and release values blinded by conventions and mundanity. On the other hand, good art relies on artists’ ingenuity and intuition. It is somehow like a myth or legend which is difficult to reach and understand. In contrast, practices in digital imaging require a significant amount of technical proficiency and detailed procedural planning; digital media provide their users with powerful expressive means. Some may find it counter-intuitive. How can an artist work with digital media and struggle between machine structure and technical standard on one hand, and emotional expression, inspiration, imagination, and free association in the creative process on the other? In the two studio courses, Digital Imaging and Digital Imaging II-Visual Narratives, students were trained under such challenging settings, learning how to work with proficiency, chance, and intuition, exploring tactics in various stages that result in a unique “balance” in their artistic choices specific to their proposed projects. At the beginning of the first semester in 2018, each student received a project element through a random draw: a specific time interval or an environmental setting. Within a few months, they had to develop and complete the art project through a series of class exercises, working with limitations and aspirations, striving for excellence in art. The class exercises included technical training in digital imaging, the exploration of material-specific and context-specific expression, and study and practice in the narratology of juxtaposed imagery. 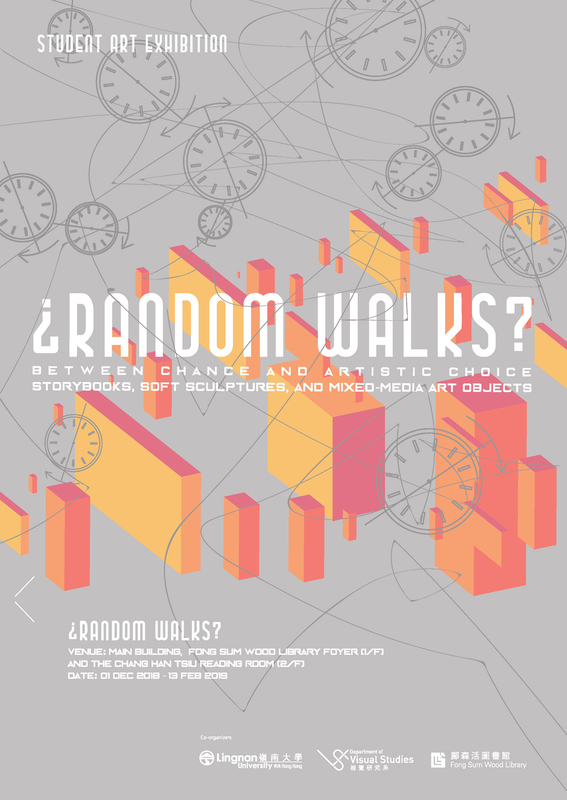 The exhibition ¿Random Walks? features thirty works by Lingnan students, produced in the above two courses, consisting of storybooks, soft sculptures, and mixed-media art objects, which are displayed in the Fong Sum Wood Library Foyer(1/F) and the Chang Han Tsiu Reading Room (2/F). The project started as a random “walk” along different art routes and ended as a series of authentic expressions that capture memories, concerns, wishes, and imaginations.